That’s not how it goes, but it is a reflection of Mets baseball like it oughta be, right? This is the pitching-rich organization, the franchise defined by the Franchise, whose most delicate operations were once assigned to the Doctor, whose annual offseason talking point is how good its rotation is. That’s what one of our aces is talking about  as 2017 looms, it’s what got us giddy going into 2016. The starting pitching was real good last year, if not as great as we cracked it up to be. On paper and occasionally in practice, we had a Fab Four, several Fifth Beatles and a couple of crucial Wings for when almost everybody else fell through. There’s no way the Mets would have hung on as they did without their starting pitching. But there would have been nothing to hang onto had it not been for their slugging. More than at any point in their 55-year-history, the Mets we met lived up to the real lyrics in their Metropolitan anthem. The Mets were really socking that ball, hitting those home runs over an array of walls 218 times, more than they ever had before. The previous team mark was 200, set in 2006, so this year truly represented a decisive blow for striking decisive blows. Met home run records are not easily surpassed as a rule. The 1962 total of 139 stood as the impregnable house standard all the way until 148 were launched in 1986 (68 more wins, just nine more homers; go figure). On the lone batsman front, we’re about to enter the third decade of Todd Hundley’s 41 proving difficult to tie—only Carlos Beltran has done so— and impossible to top. Hell, it took thirteen years for Dave Kingman’s 36 to unseat the Original Frank Thomas’s 34. I’m guessing you didn’t know 200 had been the Met record or that it was set in 2006. I didn’t know it, and I’ve been accused of knowing lots of stuff like this. It’s quite likely your garden-variety knowledgeable Mets fan would have been quicker to tell you about the 1980 Mets and their notoriously low 61 homers than any edition that cranked out more than three times as many. Your New York Mets simply tend not to hit a lot of home runs, so when they reverse form in record-rewriting style, it deserves to grab our attention. It has. In recognition of the record that provided the backbeat of a playoff season, Faith and Fear in Flushing presents its Nikon Camera Player of the Year honor — the award bestowed upon the entity or concept that best symbolizes, illustrates or transcends the year in Metsdom — to The Home Run. Without it, we surely would have been…OUTTA HERE! Home run production rose as a rule in 2016, with 5,610 rounding the bases throughout the majors, second-most ever, a veritable tick behind the 5,693 clobbered in 2000. That was at the height of the something’s-up…and we don’t just mean baseballs flying through the air…era. Nobody tested for anything back then and we were a few years from genuinely wondering how everybody had gotten so darn powerful at once over the course of the previous decade. PED testing and improved pitching were supposed to have taken care of that unnatural spike. In 2014, all of baseball got all of the baseball, so to speak, 4,186 times, making for the lowest full-season (non-strike) home run total since 1993. Normality had returned. Then another new normal took hold. The number jumped to 4,909 in 2015 and practically broke the windows across Waveland Avenue this past season. Was pitching not all it was cracked up to be? Were the balls wrapped tighter that specifications dictated? Did somebody miss a test? Without anybody pushing 60 or even 50 home runs (Mark Trumbo, with 47, was the only major leaguer who topped 45), it didn’t feel like anything out of the ordinary was going on. Let’s shrug our shoulders and admit we have no concrete idea. The strangest thing, relative to our parochial concerns, was the Mets finished second in the National League in home runs, seven behind St. Louis. The Mets are almost never one of the top two home run-hitting teams in the league. They placed first every year from 1988 through 1990 — Strawberry, McReynolds, HoJo — but have otherwise historically found other ways to score. In 2016, the Mets found almost no way other to score. When they weren’t homering, they were abstaining (courteously), finishing eleventh out of sixteen in runs sans home. They had the fourteenth-most doubles, fourteenth-most triples, fourteenth-most steals, eighth-most walks…but, oh my goodness, as a unit, boy they could homer. As individuals, they did OK, too, though not to an eye-popping extent. You’d guess the team with the second-most home runs in the National League would be represented among the most sluggingest of sluggers. Good intuition, bad result. No Met was among the five top home run hitters in the N.L. Jay Bruce finished tied for sixth, but 25 of his 33 were swatted for Cincinnati. You don’t find a Met among the league leaders until you get to the ninth-highest position, for which Yoenis Cespedes tied Yasmany Tomas with 31, a total that is robust enough, but not that impressive in the annals of Met single-season homering. Thirty-one, certainly a pleasant number in the realm of Metsopotamian association, has been exceeded twenty-five times in Met home run history. No. 31, Mike Piazza, did it four times, Darryl Strawberry, Howard Johnson and Dave Kingman three times. Ike Davis and Bobby Bonilla — to name two no more than semi-legendary Met mashers — each blasted more than 31 in given years. It’s a damn fine total (no Met before Cespedes had ever hit exactly that many, and Yo reached it in only 132 games played), but it’s nothing overtly landmark, not even for a traditionally power-averse outfit like the Mets. Where the club bulked up was with several very good if not great totals; call it strength in numbers. Behind Cespedes lurked Curtis Granderson with 30 (and, seemingly, 15 RBIs, but he really drove in 59), Asdrubal Cabrera and Neil Walker with 23 apiece (a middle-infield power combo for the Met ages), part-timer Wilmer Flores with 16 and the Gun of April, Michael Conforto, with 12. It could have been a double-digit festival to behold had a few more balls carried or stayed fair off the bats of James Loney (9), Kelly Johnson (9), Jose Reyes (8), Bruce (8), Lucas Duda (7) and David Wright (7). You’ll notice a thread running through everybody who missed 10 by just a little: none of them was on the active Met roster for close to a full season. The Mets stitched together a lot of partial individual seasons to get where they got, but each of them charged with an ample power supply. Four Met rookies — Ty Kelly (1), Matt Reynolds (3), Brandon Nimmo (1) and T.J. Rivera (3) — hit their first career home runs as 2016 Mets. One Met due in Japan  — Eric Campbell — hit what looms as his last North American homer, at least for a while. Journeymen like Justin Ruggiano (2), René Rivera (6) and Alejandro De Aza (6) chipped in their share. Travis d’Arnaud (4), Juan Lagares (3) and Kevin Plawecki (1) you figured might have been good for a few more. Lest we forget about how important Met pitchers were to 2016, Noah Syndergaard tied Walt Terrell with two home runs in a game and Tom Seaver with three in a season. And, as if it’s escaped your short-term memory, erstwhile New York Mets and current Atlanta Braves starting pitcher Bartolo Colon hit one…one home run, that is. According to Baseball Reference’s essential Play Index tool , you get to 218 with 10 lidlifting leadoff homers (seven from Grandy, three by Jose); back-to-backers to start a game for only the second time in franchise history (Jose and Asdrubal replicating what Jose and Ruben Gotay did in 2007); 13 of the pinch-hit variety; 7 grand slams; 32 spanked on the first pitch of an at-bat; 21 on a full count; 7 apiece off Jeremy Hellickson and Tom Koehler; 17 that tied games; 62 that untied games; 2 from designated hitters (though we won’t hold that against them); 45 in August, spanning the month that went to hell and came back on the verge of heavenly; 112 at previously daunting Citi Field; 18 at Citizens Bank Park, including 6 in one game there; 10 to the opposite field, 2 that were part of an overall six-for-six afternoon (Wilmer’s), 6 in extra innings; and 4 that definitively ended games. Walker started the fun with a line drive to right off alleged “old friend” Chris Young in Kansas City on April 3 (help beat us a World Series, you’re not much of a friend). Ces gave the home folks one to grow on at Citi Field on April 10. It was a quiet first week or so: eight games, two home runs. Then it was off to Cleveland, future site of epic cursebreaking, and, to borrow from Romy and Michele’s High School Reunion, Explosions! The Earth Was Moving! Was That An Earthquake? No, it was the Mets with seven home runs in a weekend visit to Progressive Field, just ahead of the dozen that left Philly across three more games. At that point, it was off to the races, a.k.a. Home Run Derby. How about that freezing April night a hobbled Yo came off the bench or out from behind the scenes or wherever he was and proffered a three-run pinch-bomb to tie the Reds in the seventh? And how three nights later when he cherried the bleep out of an offensive sundae by blasting a grand slam to top off a record-setting twelve-run inning? Of Cespedes’s 31 homers, approximately a thousand of them were Amazin’, Amazin’, Amazin’. Even the requisite great home run launched in a losing cause was a truly great home run: a nine-pitch battle versus Adam Wainwright ending with a wallop deep to left, putting the Mets up 4-3 in a game that got itself lost 5-4. But Yo — the first batter to visit Citi Field’s promenade during the course of play (versus the Cubs on June 30) — did much in winning causes, particularly those three homers in two games in his first series back at San Francisco. Cespedes hit one of the stretch drive walkoffs, too, but drama was present in nearly every swing from nearly every Met during late August and throughout September. Granderson, who posted 10 of his 30 from August 30 onward, saved two for the same set of extra innings, tying Minnesota in the eleventh on September 17 at Citi Field and beating them in twelfth. Rivera earned his first curtain call (road game notwithstanding) by breaking a 3-3 deadlock in Washington in the top of the tenth on September 13. Reyes never hit a bigger Met homer than the one that tied the Phillies at six in the ninth on September 22, and no Met hit a bigger homer in 2016 than Cabrera’s game-winner two innings later. When Cabrera badly needed a day off in early September, Reynolds picked up any hint of slack by belting one out of Great American Ball Park. Bruce didn’t do nearly enough, but when he got around to slugging, his four homers in the last week of the season reminded you why he was always such a trade target. Wright couldn’t move around very much, but he got around on three pitches for four bags apiece in his last week of action way back in May. Walker missed a little more time than desired, but his bat kept the dam from bursting when his three-run job salvaged the last game of the Rockies series at the end of July and a two-run ditty did the same trick a week later at Detroit. Johnson’s well-timed clout was the “1” in a 1-0 thriller that went eleven at Turner Field. 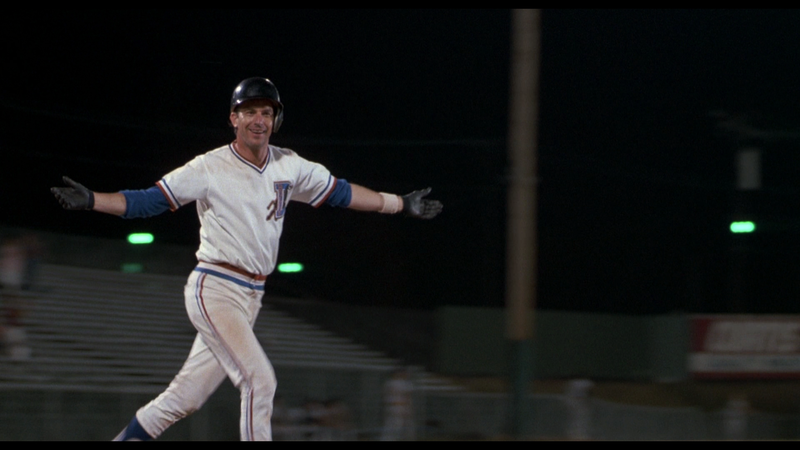 And, finally, Loney did a convincing Crash Davis impression  when he reacted with authentically earned WOW, ME, HUH? glee as his sixth-inning round-tripper, the last Met shot of 2016, more or less clinched the Wild Card on October 1. Did we mention Bartolo? Even if we did, it bears repeating: Bartolo Colon hit his first major league home run, for the Mets, on May 7 in San Diego. Rob Manfred immediately disqualified himself from future Hall of Fame consideration by not immediately abolishing the DH. You can close your eyes and see them all if you try. Or, as our friends at Amazin’ Avenue  recommended, you can go to YouTube and watch them all in a row . Two-hundred eighteen home runs take about 44 minutes to witness in a montage, about six months to properly enjoy, and about 55 years to compile. Indeed, it required more than a half-century, but at last, we Mets fans could say everything was coming up Apples .